Emporium Hotel South Bank has once again raised the bar in luxury boutique accommodation with the unveiling of its opulent Frangipani Suite; which is the pièce de résistance in its range of stunning premier room offerings. Starting from $2,800 per night, the breathtaking 150sqm retreat exudes extravagance and is available for booking now. Located on the 20th floor of the hotel, the truly one-of-a-kind Frangipani Suite is the epitome of lavish style and comfort. Lusciously appointed, the expansive space provides a superlative experience for the luxury traveller, with a range of contemporary touches. 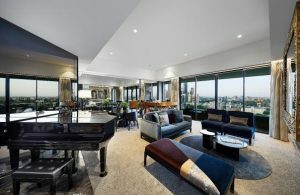 A formal double entry with marble flooring leads to an elegant living room with baby grand piano, double-sided fireplace, a spectacular handmade bronze bar with seating for three people, and a private balcony with seating to take in the magnificent, uninterrupted views of the Brisbane River and the city skyline. A karaoke/media room delivers endless entertainment, whilst a separate study caters to the executive business traveller. Additional lavish finishes include 3m high coffered ceilings, a full-bottle Eurocave wine fridge, mini-bar, two 55-inch mirror-finish LED televisions Bose Soundbar, king-size bed, spacious walk-in wardrobe/dressing area, and powder room. The generous, immaculately finished ensuite features a free-standing bath with a city/river outlook, double marble shower with both handheld and rain shower heads, a 32inch mirror television, white marble double vanity and separate toilet compartment. An interconnecting River City King Suite is also available to book, increasing the total space to 190sqm. The Frangipani Suite completes the hotel’s offering of eight Premier Suites which were revealed last month and are available for booking now, including two Exquisite Suites, two Emporium Suites and three Poolside Cabana Suites. Guests of Emporium Hotel South Bank’s Premier Suites can also enjoy a complimentary inner-city transfer service in a brand-new Maserati Levante.